Wow, this is my very first tag! 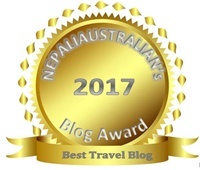 I am honoured to have been nominated by https://orangewayfarer.wordpress.com/ who writes a great blog of her wanderings. Like herself I am officially one month into my blog, and I must admit it is a lot of hard work and dedication. Though as a result I have learned so much from so many inspiring and supportive bloggers. Embracing each corner of the globe, our thoughts and stories are rediscovered and shared. Once again, thank you orangewayfarer, for the nomination. Below are your 11 questions answered. I must admit, I was a bit nervous when I caught a glimpse of the questions, but then I realised what a great way for my readers to discover something different about me. Do you read books? What is your most favourite book? What fish do you like to eat, if you eat fish at all! How many times you have broken up a relationship and why? Well this will test my memory. I think a few times. It was so long ago. I believe you just know when the right person comes along and mine came along 24 years ago!! Have you ever lived alone in a faraway city from home? How do you like to explore a city? I tend to do a lot of research before I travel. Travelling with children you need to be well equiped and prepared, but I am a bit of an organisation freak. I have check lists and notes for absolutely everything. In terms of exploring we usually pace ourselves accordingly with the kids and we try to see as much as we can by either foot (preferably) or sometimes by sightseeing buses if we are limited with time. Any regret you have in life? Yes. I regret not travelling when I was young and single. My passion for travel began in 1998 whilst on my honeymoon. One thing you are scared of. Well that’s an obvious one. For those who know me very well, I have a fear of birds. I know, don’t laugh, they really scare me! I can’t pinpoint the happiest moment as there are a few. My wedding day and the days my children were born. Have you ever maintained a journal? Where is it now? 1. What is your “dream” holiday destination? 2. The most disliked place you have travelled to? 3. If you could learn a foreign language, which would it be? 4. Do you prefer Summer or Winter? 5. What have you learned form blogging? 9. What is the first thing that comes into your mind when you think of the colour red? 10. One word to describe your partner/ loved one (if there is someone) . *Blue sky tag picture uploaded from web. So you did it! Lovely. Love to read your answers. Khaled Hosseini is my favourite too. The Girl With the Pearl Earring by Tracey Chevalier is something I am gonna look out for now. Do visit Kolkata, my city. I will show you around. Glad to know you are a mother. Tell me about your children? I did….yay 🙂 You’re very welcome. I’m glad you have a new book to look out for, they also made this book into a movie, which stars Scarlett Johansson, and is worth watching. Yes, I am a mother of two teenage children, 15 and 13. They are wonderful kids and I am very luck to have such loving and caring children. They have been blessed to have travelled the world with us and their passion for travelling is ever growing, which I admire. Haha, my family and I are the same way with travelling. We have everything very well planned out, especially on road trips; day trips are a little easier 🙂 Thank you for nominating me! I’ve already posted about this tag a couple of times, but I’d like to answer a few of your questions. Aside from Spanish, I’d love to learn French and Italian! And the things that make me laugh are funny videos on YouTube, silly facial expressions, and well-timed jokes. French and Italian are beautiful languages. My husband’s family is Italian so we are exposed to Italian often 😉 Thanks for answering a couple of questions. I love to read about your passion for travel. I haven’t had the opportunity to travel much, but I hope to explore the world one day! Thanks ever so much for tagging me. It is an honour and very nice to know that I am the first one that you tagged on your blog nominees. Whilst I am happy to participate in the challenge, I usually do not require any of the bloggers that I nominate to pass on the tag, simply because doing so requires an amount of time but sometimes people don’t have to give. However, in reposting the tag and nominating other blogs, I have great joy in highlighting new blogs. They are the blogs that need more visitors to discover them. So thanks again for the nomination. I appreciate it. The added benefit,as you said, is discovering more about you, and the other nominees, as a result of this challenge. Marcus Zuzak he used to regularly visit my kid’s high school and talk to parents and kids about books and writing. A great speaker. and we are both Australian!!! Great! You have some amazing answers. Thank you so much for tagging me. I don’t usually participate in tags, and I really appreciate you including me! Ha ha! I appreciate that, and you. Have a wonderful week. ❤ Feel free to contribute to Forgiving Fridays anytime. Blessings to you!